iPad, Android and even Windows 7: can Windows 8 win out? Can Windows 8 deal with the challenge from various quarters? The news is full of tablets but popular as they are, they're still a tiny fraction of the million PCs that ship every day. That's one of the things Microsoft is counting on with Windows 8; that it can build on the scale of PC sales to sell tablets with the same Windows 8 Metro experience. But Android and iPad aren't the only challenges Windows 8 is going to have to overcome next year, and some of the biggest problems come from Windows' own popularity. Even if Apple and Samsung battle each other to a standstill in court, that doesn't leave the market open for Windows 8. Apple's tablet has singlehandedly defined the tablet market - as it turns out, because Steve Jobs was determined to teach Microsoft how to do tablets properly. It's got powerful apps - like the upcoming tablet version of Photoshop, integration of ITunes, digital magazines and other key tablet services. It's also got huge mindshare. We don't know what Apple has planned for iPad 3, but whatever it is - that's what Microsoft has to beat. Google is far from replicating its smartphone success with Android tablets, but Honeycomb 3.2 is starting to make an impact. Amazon's 7-inch Kindle Fire tablet could be the worst competition; subsidised by Amazon to sell more content, it will have a wide range of apps, including Netflix. But you can get Android tablets in all sizes, with keyboards that clip on or slide out of the way, with active digitiser pens for drawing and writing on screen. You certainly can't do everything on an Android tablet that you can on a PC, any more than an iPad completely replaces a Mac, but with a web browser you can do a substantial proportion of what you want to do - on a thin and light device with a battery that lasts all day, for a substantially lower price than a PC. Windows 8 will have to do a lot more, with longer battery life and lower prices than today's PCs, if it's going to compete with existing tablets. Malware is a problem on every platform popular enough to be worth attacking. It's a nascent problem on Mac OS and Android and it's far more of a problem on Windows XP than it is on Windows 7 because of security improvements. Windows 8 will add a lot of those, including starting your anti-virus software before Windows itself starts up - and blocking rootkits by checking whether the code that boots your system has been interfered with. It does that using a feature in UEFI (the replacement for the BIOS) called secure boot; this checks both the firmware and if the boot components have been signed with a valid key and match what's in the UEFI 'allowed database' (UEFI also checks for known malware). To get a Windows 8 logo, PC will have to ship with secure boot enabled and some Linux enthusiasts have suggested that this will stop you putting an alternative OS on a Windows 8 PC; despite HP and Dell confirming that they'll ship PCs that let you turn off secure boot if you want to, the Free Software Foundation is running a campaign against secure boot. Microsoft has answered this one pretty thoroughly already. If you can turn off secure boot - as you'll be able to on pretty much any PC - you can install any operating system you want. It's also possible for Linux distributions to add support for secure boot ("How secure boot works with any other operating systems is obviously a question for those OS products," Steven Sinofsky noted on the Building Windows blog). There is a question how Linux distributions can securely distribute the keys that UEFI will use, but mostly this is a propaganda issue. Although BlackBerry is falling behind in sales and PlayBook hasn't made much of an impression compared to the iPad or even the more popular Android tablets, RIM's plans for its next generation operating system have a lot of similarities to what Microsoft is promising for Windows 8 tablets. Running on ARM with hardware graphics acceleration that promises impressive gaming support, offering HTML5 for browsing and applications, with a unified operating system allowing developers to more easily target both tablets and phones and a new 3D framework with fluid and charming animation effects; the systems underneath are very different but BBX and Windows 8 for ARM may well ship at the same time and attempt to solve some of the same problems. Metro apps will run on all Windows 8 PCs, whatever chip is inside them. And Windows 8 will run any program that runs on Windows 7; at least on an Intel PC. Existing Windows apps won't run on ARM tablets and the Windows app store will be the only way to get Metro apps onto Windows 8 ARM tablets, but given that there's enough of Windows32 on ARM to run the new WinRT APIs and that the Task Manager is a desktop app - we predict some confusion about what runs on which Windows 8 PCs, unless Microsoft does a really good branding and marketing job on new devices. Steven Sinofsky did tell TechRadar at the Build conference that it would be obvious what runs where: "We will not have a world where you go to the store and say 'I want Photo-something or other' and there's a red box that works on ARM and a green box that works on x86. We won't let that happen. It will be clear." Even so, there's plenty of potential for mix-ups. Windows 8 for ARM will only come on new tablets and that existing ARM tablets that run Android or Web OS won't be upgradeable, even if they have the same specs - but there will be Intel Windows 7 tablets like the Samsung Series 7 slate that will be upgradeable to the Intel version of Windows 8 and we expect to see slates based on the same low-power Core processors that are going into ultrabooks. That means it's not as simple as 'Windows tablets are ARM tablets'; and even though x86 System-on-Chip PCs will have the same always connected, low power idle Connected Standby state, not all Windows tablets will have all day battery life. Having a range of weights, sizes and prices has always been an advantage for the PC because you have the choice of what you want. That's still true, but just as many early buyers found that a netbook was not actually the light and powerful PC they were expecting when they bought it, it has to be clear what the differences between different Windows devices mean. A recent survey by the Boston Consulting Group said 43% of US consumers wanted to buy a Windows tablet rather than an Android or iPad; but what wasn't clear from that (perhaps surprisingly) large market of potential Windows 8 tablet was what price they'd want to buy it for. We know what price you can sell an iPad for. Pre-sales for the Amazon Fire show you can sell a lot of Android tablets at $199. The failure of the HP TouchPad - and the success of the $99 fire sale - proves that iPad prices aren't tablet prices. Windows 8 ARM tablets have to compete with other ARM tablets, not with the $1,000 pricetag that Ultrabooks are struggling to deliver - and they have to do it without too much compromise. Almost every PC manufacturer offers an Android tablet now, so their Windows 8 ARM tablets will compete with their Android ARM tablets, as well as their PC tablets. They also have to get the Windows 8 experience right. And they have to do it by designing machines using new chips, new motherboards, new low-power buses that connect more sensors and controllers, new ways of working with peripherals, firmware systems that are new to many PC makers… they have to make a lot of choices and they have to get them all right. Given that these are the PC makers who cram today's PCs with obtrusive crapware, who are launching Windows 7 slates that don't have the resolution to run Metro properly, will all Windows 8 machines take full advantage of the new operating system? The biggest challenge Windows 8 faces is ousting Windows 7; the most popular and widely adopted version since XP and one that many users and companies are only just switching to. It's a mistake to see Windows 7 as only patching the problems of Vista - it does substantially more than that - but the new release superseded Vista so fast that it became all but irrelevant. That won't happen with Windows 7; whether it's using a different system at work or not upgrading netbooks with low screen resolution, even when they have Windows 8 as well, a lot of people are going to be using Windows 7 for a long time. 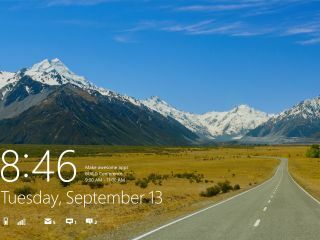 The full-screen Metro Start screen in the Windows 8 developer preview divides users in a way that's normally reserved for Mac versus PC and iPhone versus Android arguments, but it's far from the only disruptively new feature in Windows 8. The WinRT APIs and their contracts for sharing and searching across applications have significant implications for the way apps are built, and live tiles practically demand that apps be connected to an online service. These aren't incremental improvements to the way you work on your PC today; they're fundamental changes in the way you're going to be using a PC for the next decade. Windows 8 is a turning point for Windows in many ways; a grand vision that will spread to Windows Phone and Xbox in time. But many users are looking for those incremental improvements that make their life better today and if Windows 8 is too much grand vision tomorrow and not enough solid benefit today, it could be too far too fast for some users.